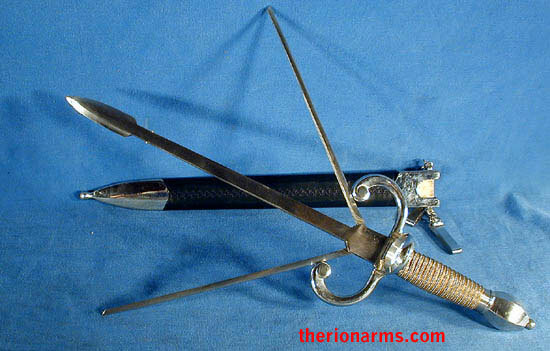 grip and pommel: 5 1/2"
The main gauche (or left-hand dagger) was often used with the rapier, providing an added dimension in both offense and defense, and most European "Schools of Defense" taught the rapier/main gauche combination. The main gauche would often stylistically match the rapier it was paired with. Replicating a 17th century museum piece, the Paul Chen/Hanwei Trident main gauche illustrates the skill and ingenuity of the bladesmiths of the period. 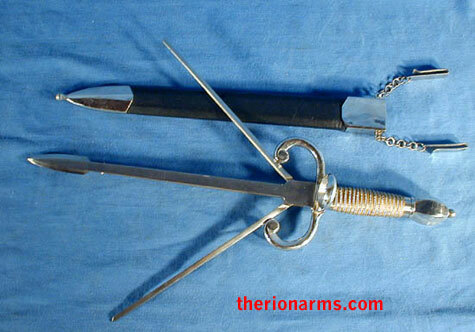 Worn as a straight dagger, the weapon becomes a highly effective main gauche at the touch of a button, when the spring-loaded side pieces of the split blade fly open to become blade trappers, giving the wielder a momentary advantage over his opponent. At the same time the offensive capability provided by the point is retained. Surprisingly, many examples of this ingenious system have survived and may be seen in European museums.